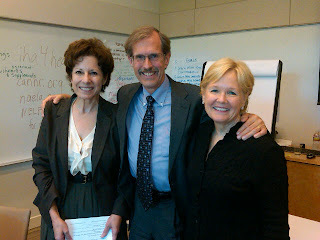 I just finished a 2-day Elder Family Mediation Advanced Training in Los Angeles. It was sponsored by La Sierra University School of Business Center for Conflict Resolution Adult Resolution and Mediation Services (ARMS). About 25 mediators and future mediators attended and participated in intensive exposure to several elder law and caregiver presentations, as well as role-play exercises. This is an evolving area of mediation, with many legal and financial issues to address in mediation, as well as family dynamics and the problems raised when there is someone with a high-conflict personality in the family. Yet the group was energetic and eager to learn how to truly help families facing issues of an aging person (often a parent), including inability to care for themselves and their finances. I was totally impressed with the thorough organization of the training, which totaled 4 days. I spoke at the last two days on managing high-conflict clients in mediation. The need for strong structure of the mediation process was made clear in the practice exercises, when several family members were participating and one of them was a high-conflict person. As with all high conflict work, you can’t just listen to a lecture. You have to practice skills and make several paradigm shifts in how you interact with high-conflict individuals. The group realized this and made good efforts to take risks and expose their weaknesses in order to become stronger mediators. Overall, I finished the two days feeling very encouraged that mediation is the best way to go in handling elder issues, and that this group of mediators will become some of the best around in the near future. I look forward to encouraging them and to future training in this field.